Following my previous posts on this fantastic Disney/Pixar line of collectibles (see also the second mug set, a note card set, a notebook, an iPhone case, a Sticky Note Set, stickers and a pencil/eraser set), here is part one of the two mug sets available! These were available first as a D23 convention exclusive last August and then made their way to the Disney Store's website (thankfully). These have since sold out but can be found on eBay for about $40. This particular set of four includes Nemo, Mike, Remy and Russel ceramic mugs (dishwasher safe). 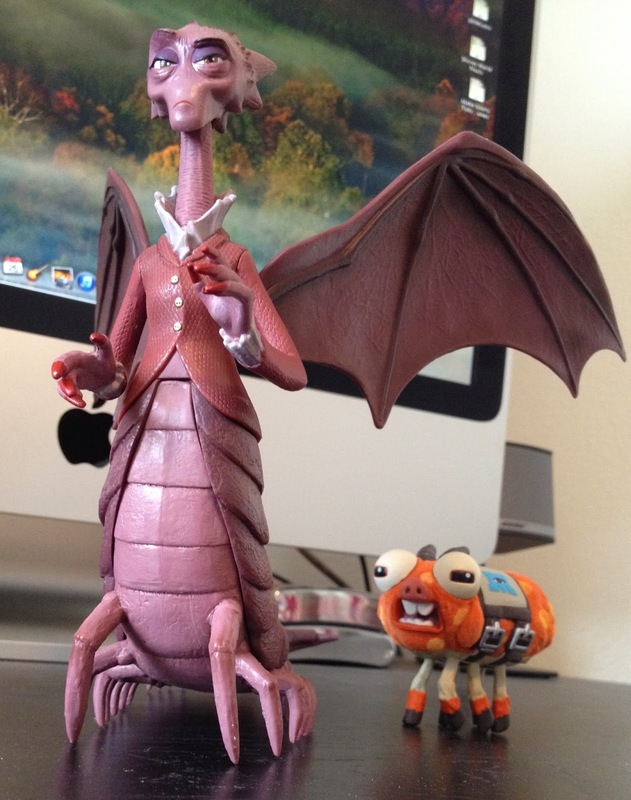 I've loved the designs of these things ever since I saw them online last year at the convention coverage! I'm so happy I was able to get these for Christmas from my in-laws (thank you so much!). The insides of the mugs match the color of the handle of the corresponding mug. I love how vibrant the colors are in all the Pixar films and these mugs really exemplify that. These pictures don't do these mugs justice! They are even cooler in person. The packaging for these things is also great..love the nod to their iconic Luxo Jr and ball on the bottom! All in all, another amazing product from Disney and Pixar. Everything here is really well made and a lot larger than I expected! I can't wait to have a place to display these (no, they won't be used for drinking from) along side the second set that was also released. More on that one soon so stay tuned! 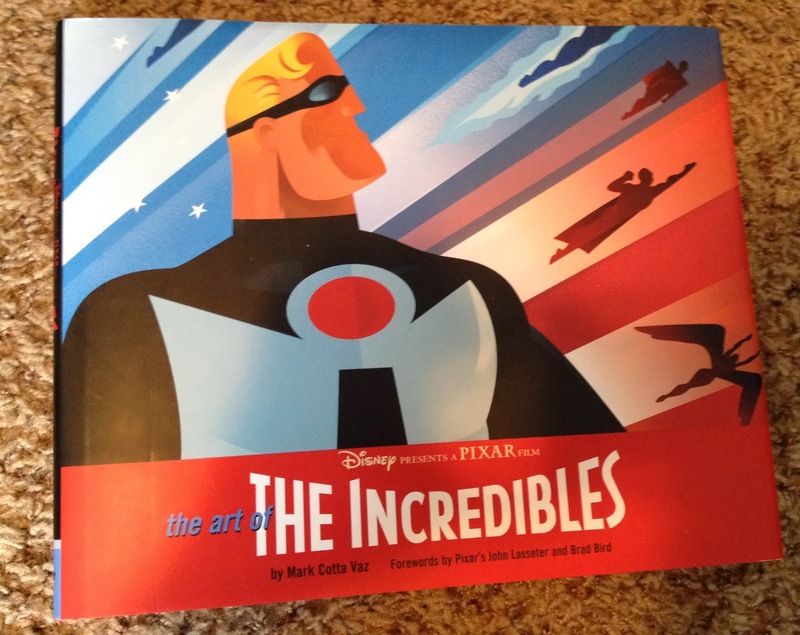 Continuing my collection of the "Art Of" books by Chronicle Publishing, here is "The Art of the Incredibles" by Mark Cotta Vaz! All of the "Art of" books are "incredible" and this one is no exception. Inside, after a brief foreword by Brad Bird and John Lasseter, you get right into the making and art of this "incredible" film. As usual, the pages are full colored and vibrant. There's a reason these books retail for $40...everything from the hardcover to the beautifully printed pages (featuring concept art and commentary on the making of the film) denotes the highest quality. I can't honestly do a full review here (since I haven't read the whole thing yet) but just from looking through and skimming some so far, it is up there with the best "Art of" books. I love the style and almost retro feel to The Incredibles and it's really neat to see (as always) how they got to the final designs you see in the film. 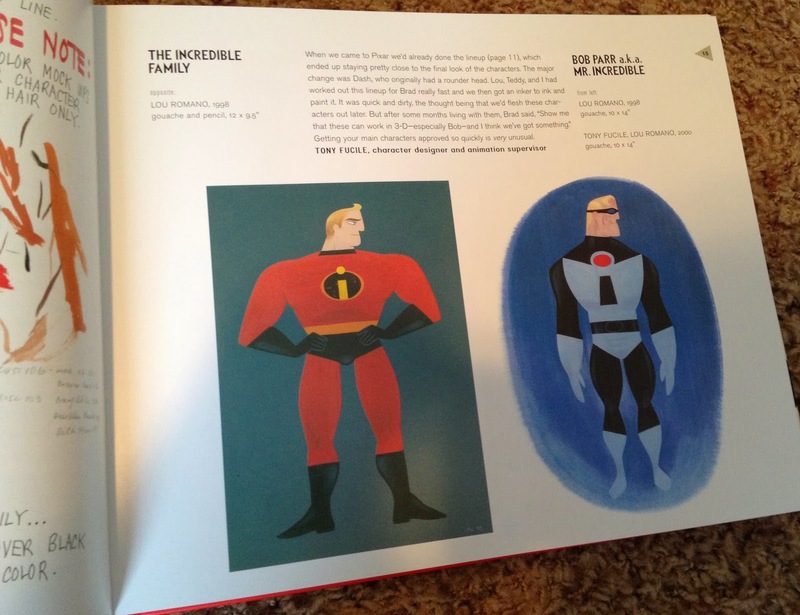 If you're a fan of The Incredibles, art, animation, Disney, Pixar, or all of the above, this is the book for you! You can snag it on Amazon now for only $28. A big thanks to my super hero fan Brother and Sister in Law, Rob and Laurie, for hooking me up with this for this past Christmas. Love it! If you're interested in seeing other books or Pixar art that I've posted, feel free to explore the labels to the right for more. 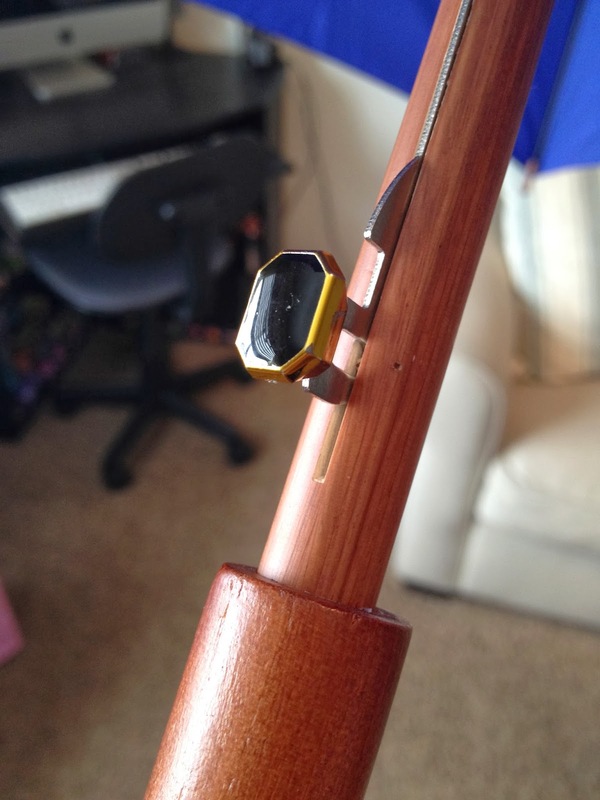 Thanks as always for checking out the blog and be sure to check back daily for even more! I will be posting many more items in the coming weeks and months so stay tuned! Please, feel free to message me or comment below if you have any questions about the items I've posted. 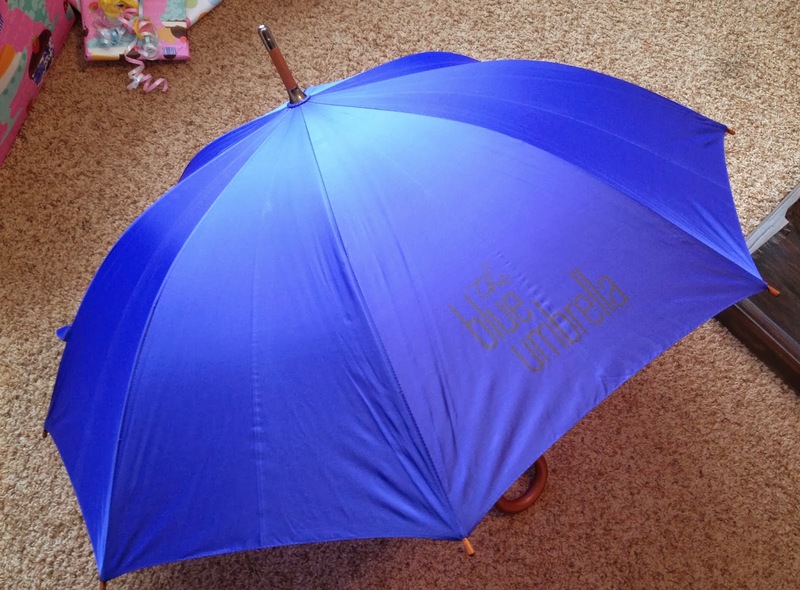 Today's post is another pretty special item...straight from the Pixar Studio Store (not open to the public), the blue umbrella from, well, The Blue Umbrella directed by Saschka Unseld! 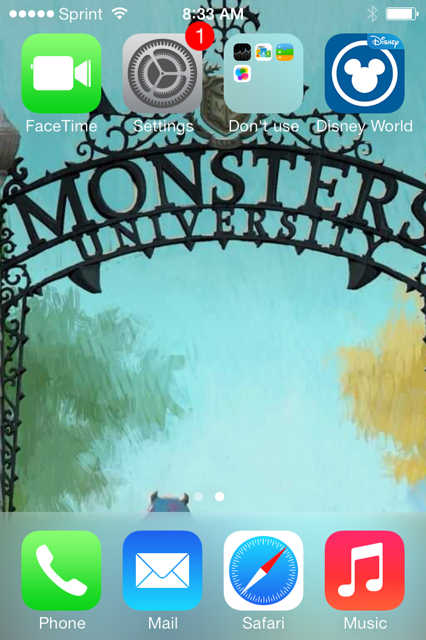 I'm a huge fan of that short film (released last year in theaters with Monsters University). The film is absolutely beautiful to me and does one of the things Pixar does best: bringing inanimate objects to life and making you feel emotion for them. 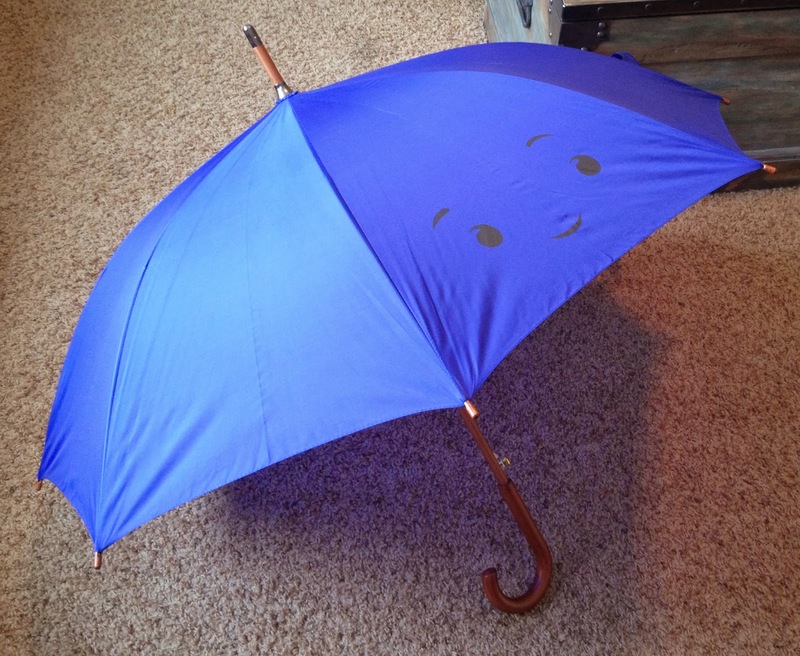 As soon as I saw the film with its gorgeous animation, charming story and a catchy musical score, I knew I needed a blue umbrella for myself and hoped Pixar would release an official one. Happily they did, however they only released it at the store there inside Pixar Studios. Why Pixar? Why do you keep on releasing the coolest stuff there where nobody can really get it? 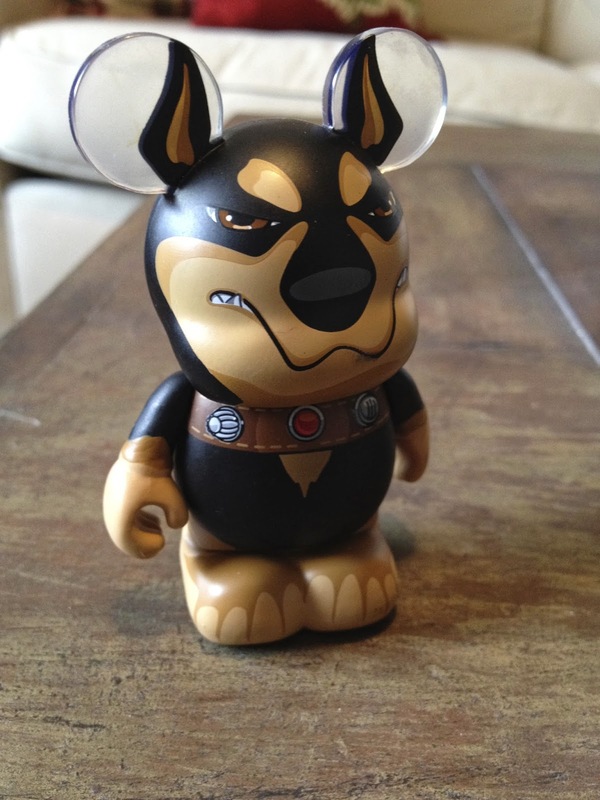 : ) I was hoping for a wide Disney Store release of this, but no. Now the trick...how do I get it if it's only there at the studio? I either need connections with someone who works there or wait for it to show up on eBay. Since I unfortunately don't know any employee at Pixar, I had to go the eBay route. VERY rarely did I see this on eBay and when I did, it was way too expensive for me to pay. Then, just last week, I just happened to check to see if there was a current listing for it...and sure enough there was! Not only that but caught it just in time as it was ending in just a few hours. The best part was that the listing had a "Best Offer" option. I wasn't going to go for it but my wife Brita was loving enough to encourage me to try! I put in my best offer and heard nothing for a few hours. At 2 in the morning, I happened to wake up so I checked to see if there were any updates with it. Needless to say, I won! It was a pretty neat and unexpected surprise as I was sure someone would offer something higher. 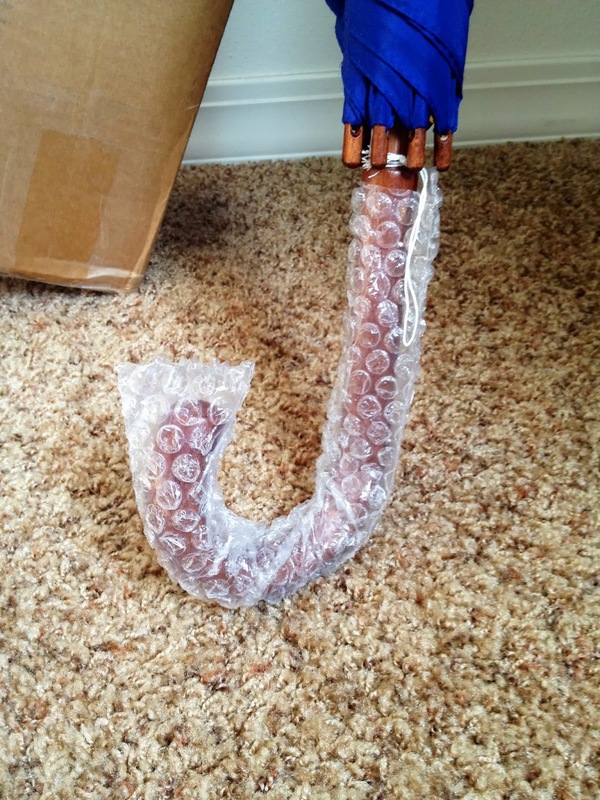 Everything about this umbrella says quality. It's just an amazing product! 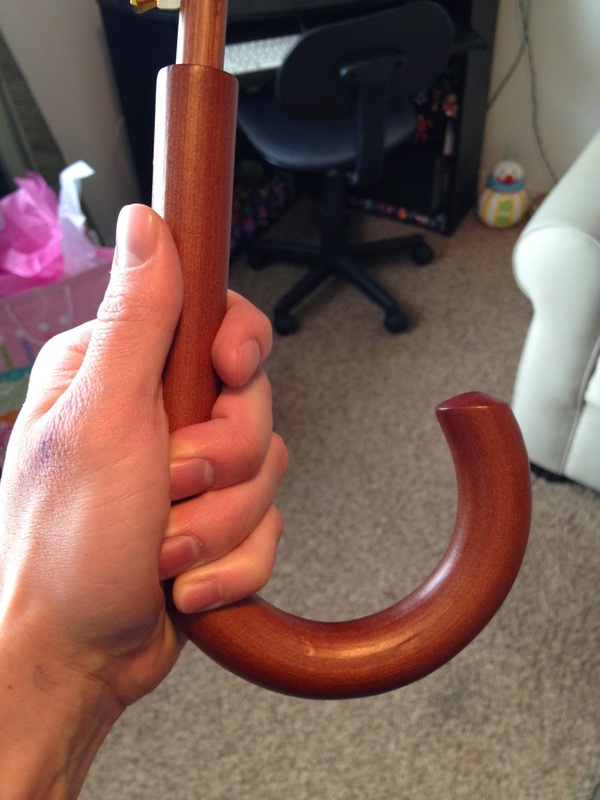 Everything is so well made from the wooden handle to the canopy. 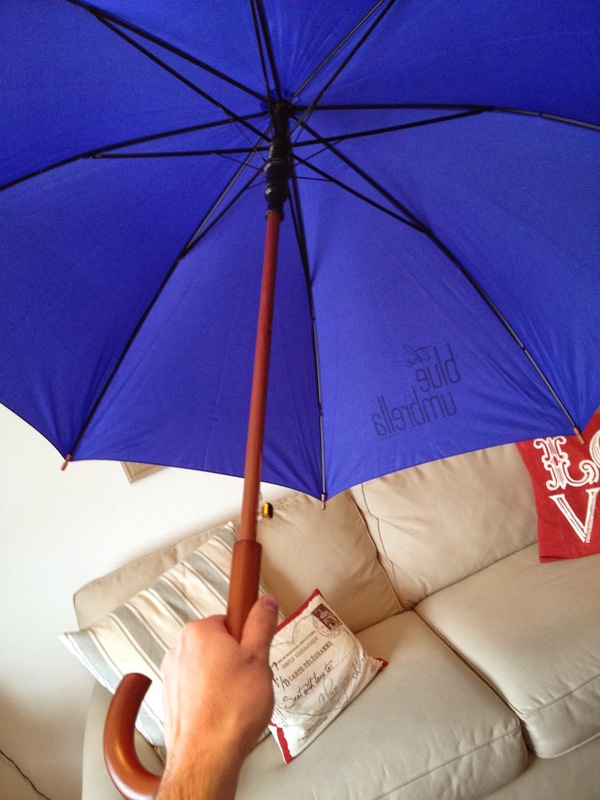 As you can see, this umbrella came brand new, pulled right from the bin at the studio store. The color is so vibrant, they really nailed the shade of blue from the film! It's like it's straight out of the short. These pictures just don't do it justice, but I tried to capture just how phenomenal this thing really is. It is well worth a high price on eBay if you get a chance. As usual, and I know I usually say this but it's true, I can't recommend this enough! 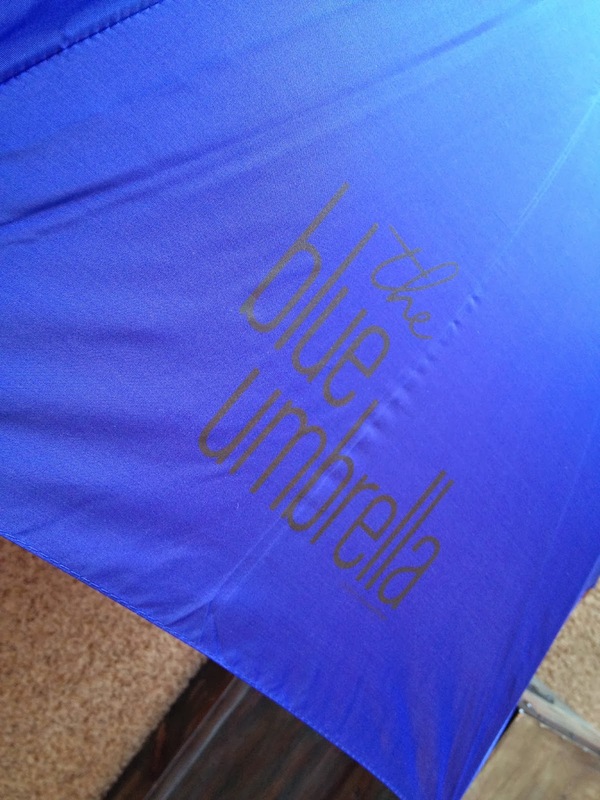 On the back, you'll find the ever so classy The Blue Umbrella logo. It's so simple, yet one of my favorites! Thanks so much for dropping by to check out my collection! Please, if I can do anything to help, just ask! Be sure to check back daily for even more items from my Pixar Collection, and, if you're a collector yourself, feel free to participate in my "Collector's Collections" page above. Now if only they'll release a similar umbrella to the public someday because I really want the red one as well. This guy isn't complete without her by his side. Which reminds me... A happy, happy birthday to my incredible Brita! Last summer, for the one year anniversary of Cars Land at California Adventure, Disney Merchandise released these two exclusive, amazing commemorative sets! 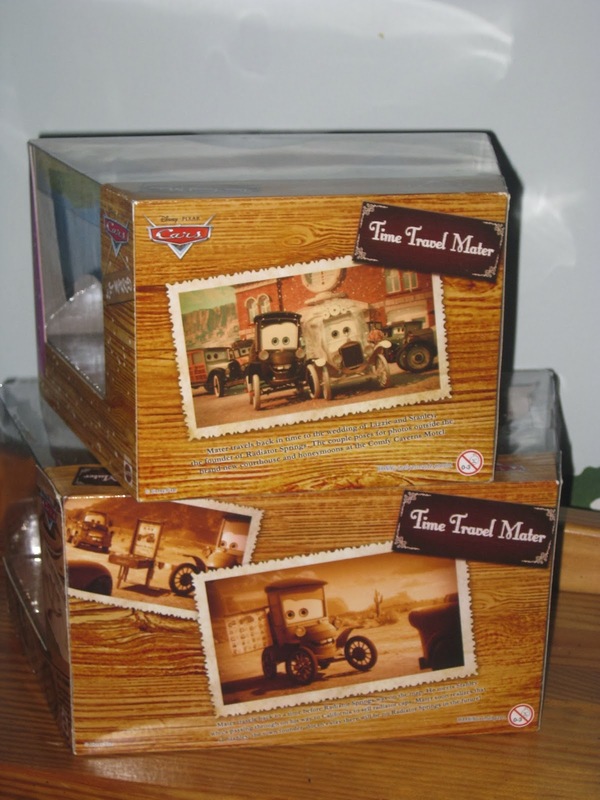 Both sets are from the Cars Toon short film Time Travel Mater (which can be watched here). I missed this 1 year anniversary event by only two months (I was there in April, the anniversary was in June) and when I tried to order these by phone when they were first released, the Disney Parks merchandise hot line told me they were sold out already! I'm like, seriously? I called within a few days of their release. Needless to say, these were dang popular! At the time, they were selling on eBay for ridiculous prices (now you can get them for as low as about $50 each, which is pretty reasonable for Park exclusive sets like these) so I needed to find another way to add these to my collection. Not long after I had tweeted about having difficulty finding these, my friend and fellow Pixar fan Brian Hughes contacted me and helped find a way to track these down from the Disney Parks! Thank you so much man. 4.) 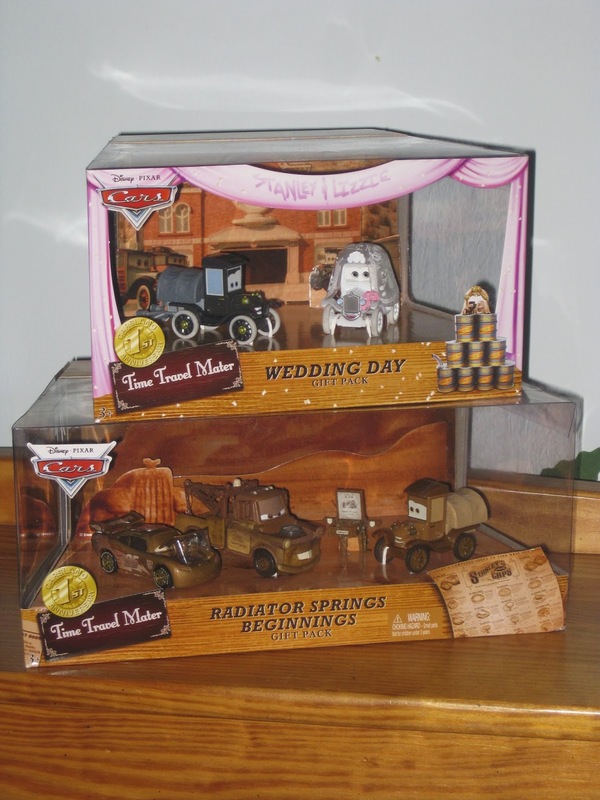 I loved Cars Land so much and these sets are the perfect items to remember it by. All in all, these were too cool to pass up. There...justified. These sets are just awesome. 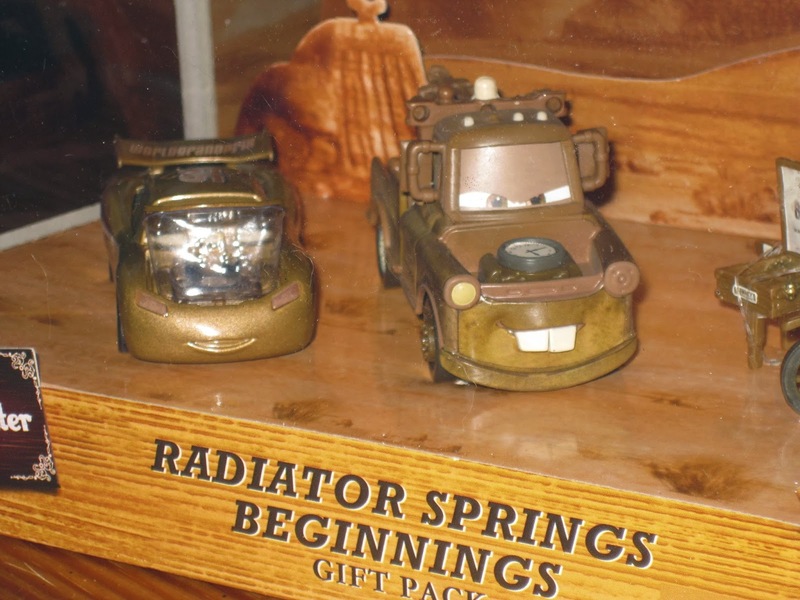 I love the sepia tone coloring on cars from the Radiator Springs Beginnings set. 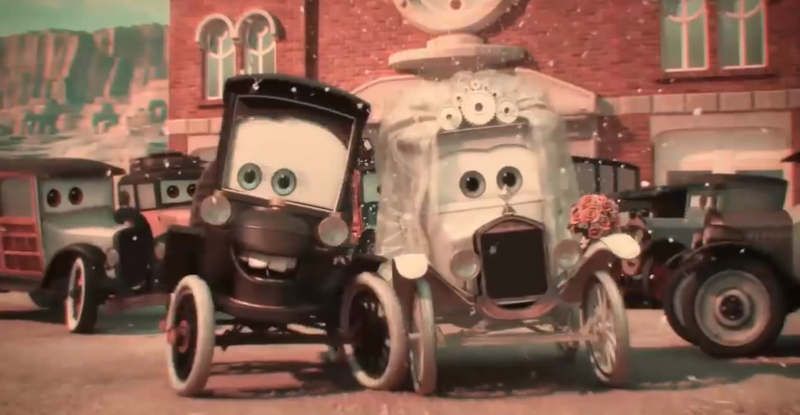 The characters look just as they do in the short since that segment of the film is also sepia tone. 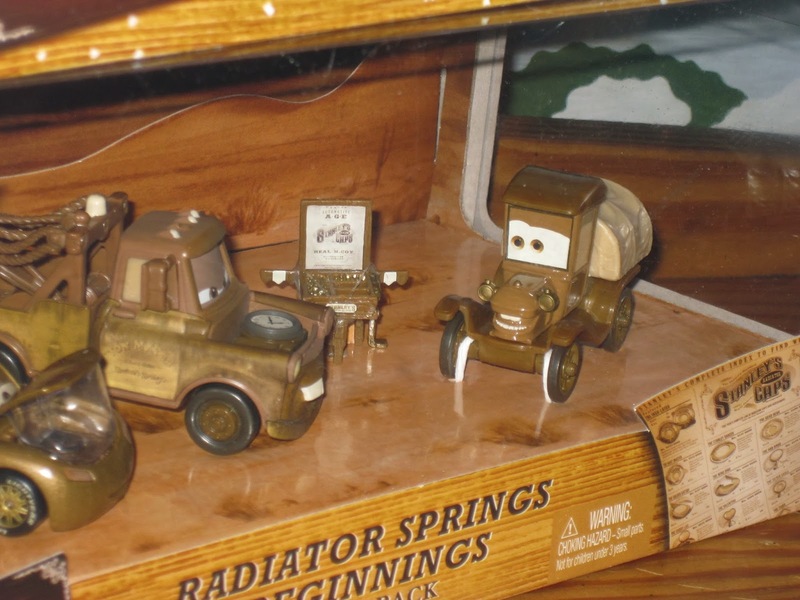 It's cool to have a (non-statue) car of Radiator Springs' founder Stanley as well! 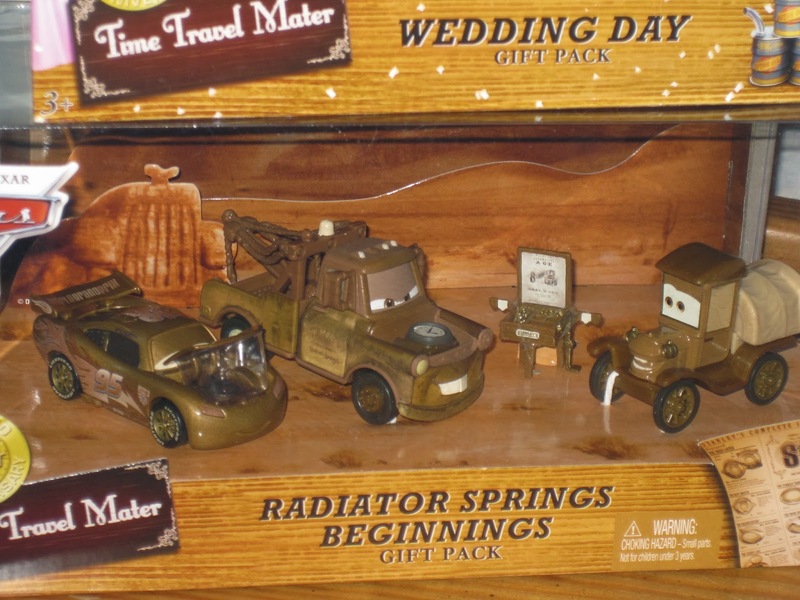 Do you think Cars Land will continue this tradition of releasing exclusive items celebrating its anniversary each year? Could we see a two year anniversary item(s) in June this year? I can only hope! I would love that. Any ideas on a product(s) they could release? What would you like to see, a toy? A collectible? An art piece? Let me know in the comments below. One other thing I wanted to note is that I also loved all the references to this Cars Toon at the actual Radiator Springs Racer ride in Cars Land! 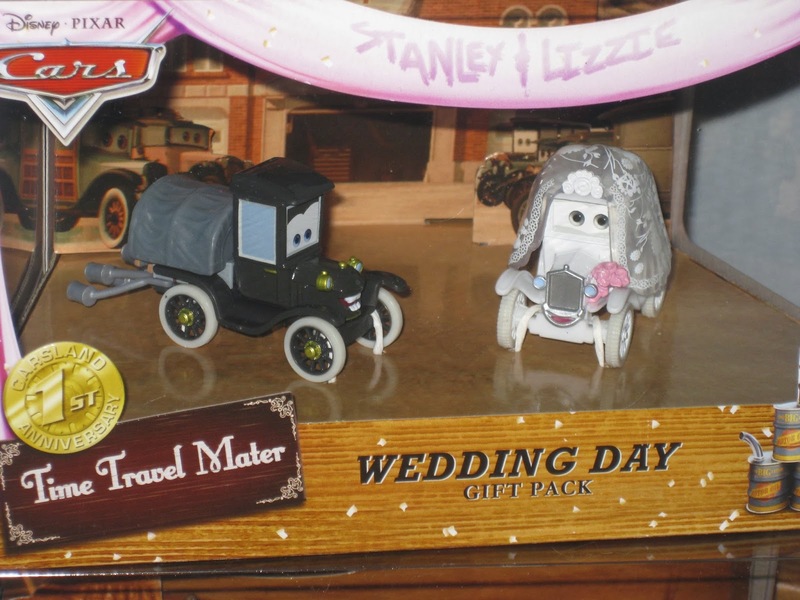 There was a wedding picture of Lizzie and Stanley hanging on one of the walls and there is the actual springs of Radiator Springs (you'll see both while waiting in line). In addition, at the end of the ride you even drive through "Taillight Cavern" also seen in the short film. Pretty cool! If you haven't gone to Cars Land but plan to, keep an eye out for those! 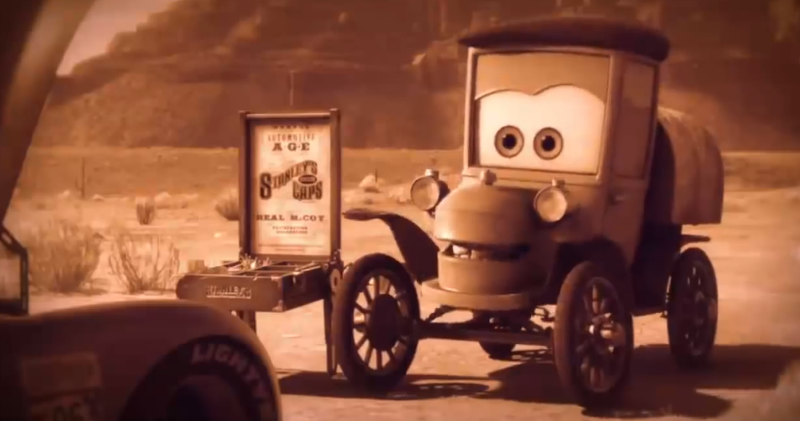 If you have gone to Cars Land, did you catch any more references to Time Travel Mater? Another big thanks to my awesome, supportive parents for getting me these Gift Packs for Christmas! 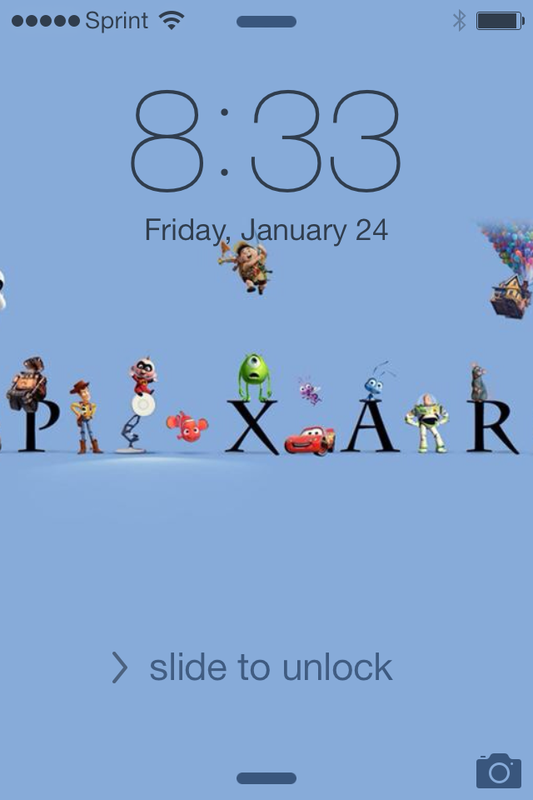 ...And be sure to check back daily for even more updates from my Pixar collection. As always, stay tuned! 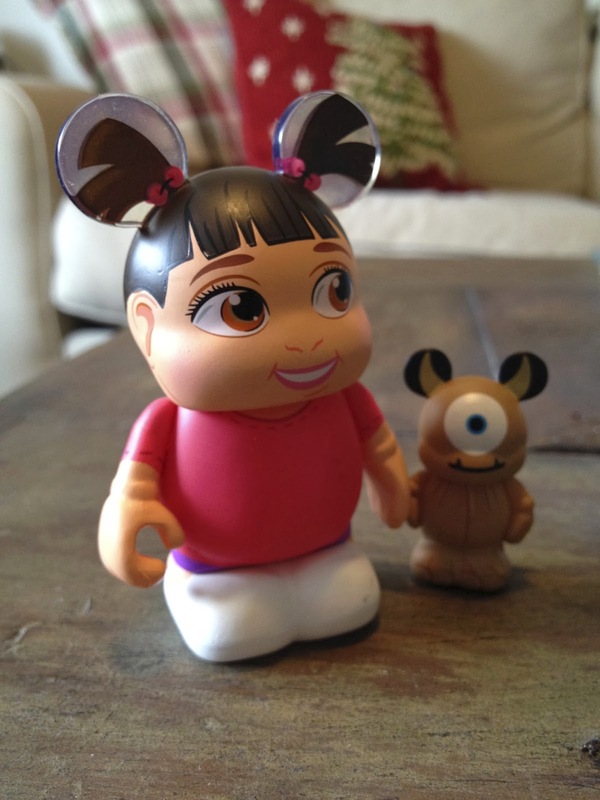 Today's post is yet another page update to the Pixar Series 2 Vinylmation page...Boo and Little Mikey! Head over to the original post for the update and more details! 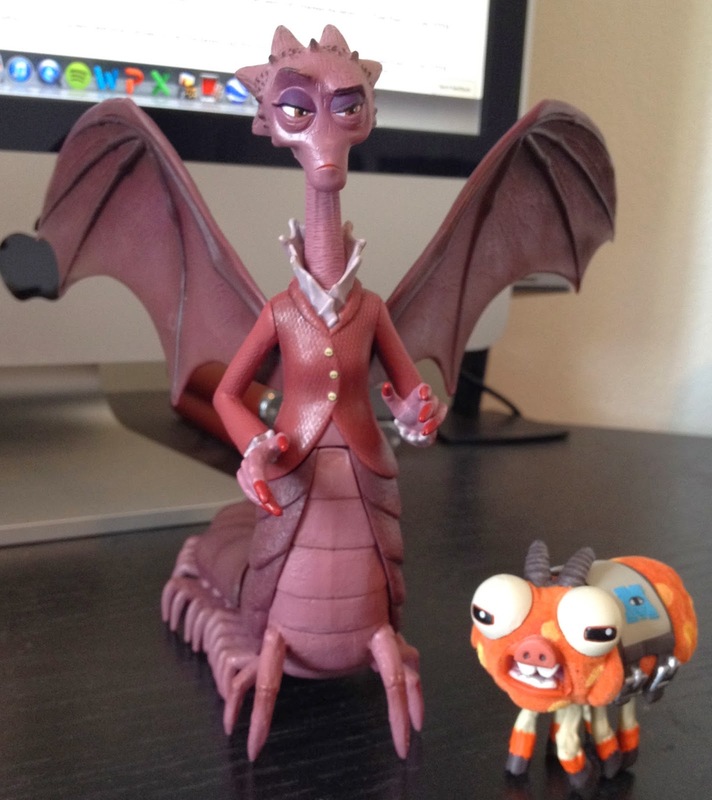 Here we have the Disney Store exclusive Dean Hardscrabble and Archie figures! These were only available as exclusive "pack ins" to a recent Monsters University figure 10 pack at the Disney Store-which has since sold out online but is available on eBay for around $50. When Monsters University first came out last year, I was so excited for the release of the action figures (since I have the original Monsters Inc. figures from 2001). The dilemma I had though was whether to get the Disney Store's figures or Spin Master's "Scare Student" figures (since basically the same exact eight characters were being made by both as well as being very similar in size and design). I ultimately favored Spin Master's figures and collected them instead of the Disney Store's versions. 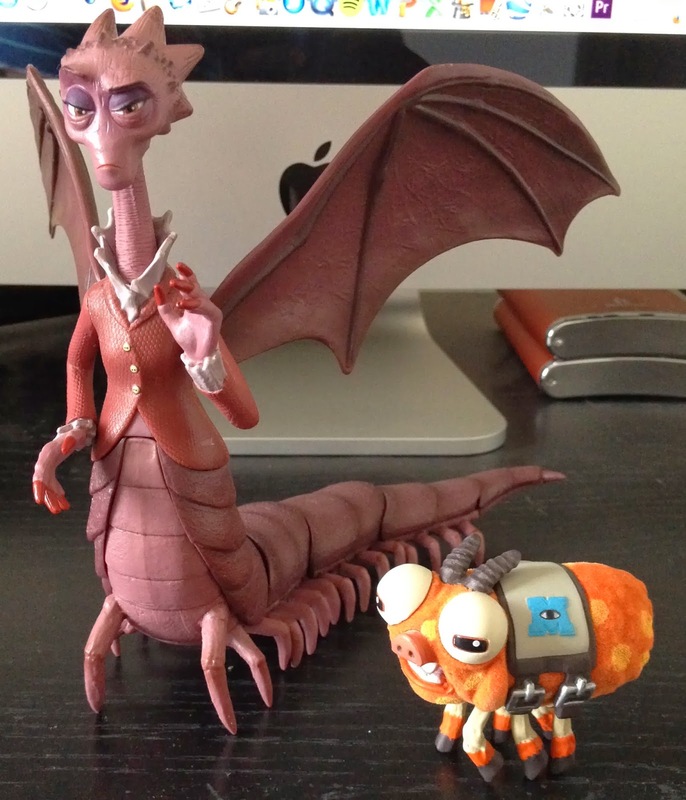 However, when the Disney Store released a 10-pack of figures late last year (In November I think), and I saw that it included exclusive Hardscrabble and Archie figures, I knew I needed to get my hands on those without having to buy the whole pack. Since the Disney Store and Spin Master figures are the same size, I figured they would fit in perfectly with my Spin Master line (since I'm assuming Spin Master won't be releasing these characters). I figured this would be my chance to add these characters to my collection, but how? I checked eBay often to see if anyone was selling them loose by themselves and found nothing. Finally, just last week, I found a seller who was selling both loose for very reasonable prices and free shipping! I was SO excited. These figures are astonishing. 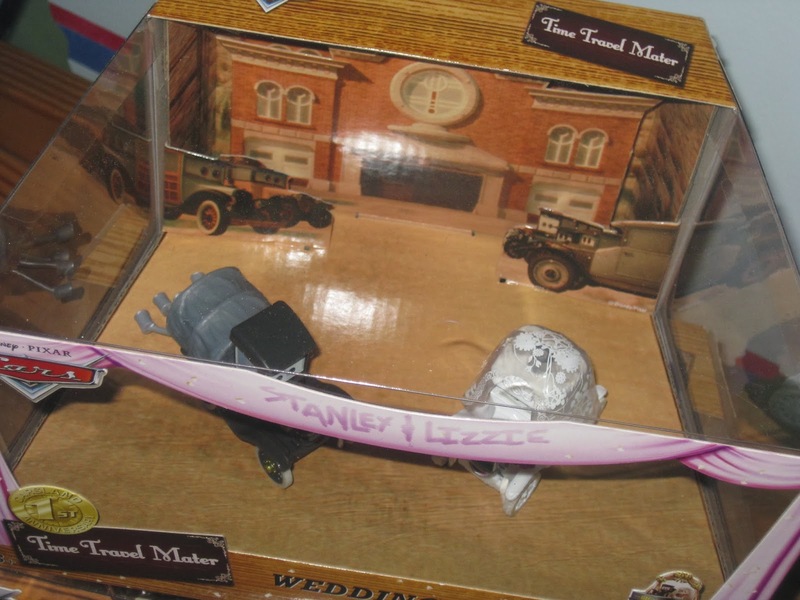 They rival any of the previously released figures by both Spin Master and the Disney Store. 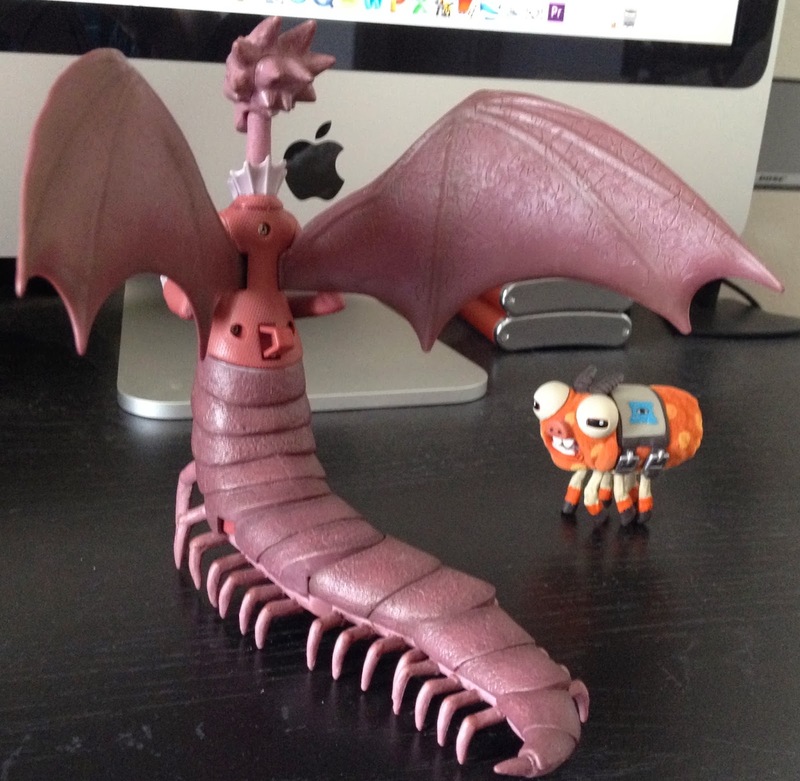 The detail is incredible...but the thing that stood out to me when I opened the box was just how big Hardscrabble is. Wow! 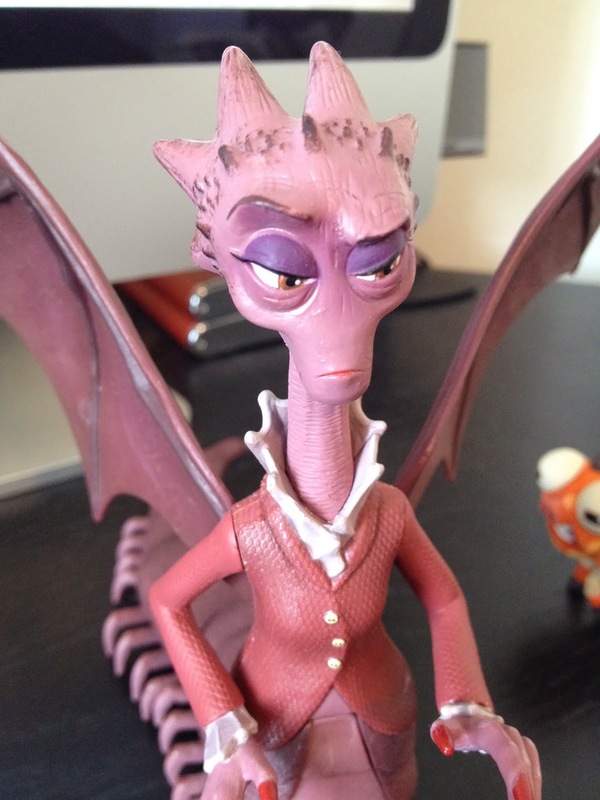 Hardscrabble even as a button on her back that gives her wing flapping action! Archie is fantastic as well with loads of detail. He stands up without any problems and even has a fuzzy texture! I wasn't expecting that but I love it. 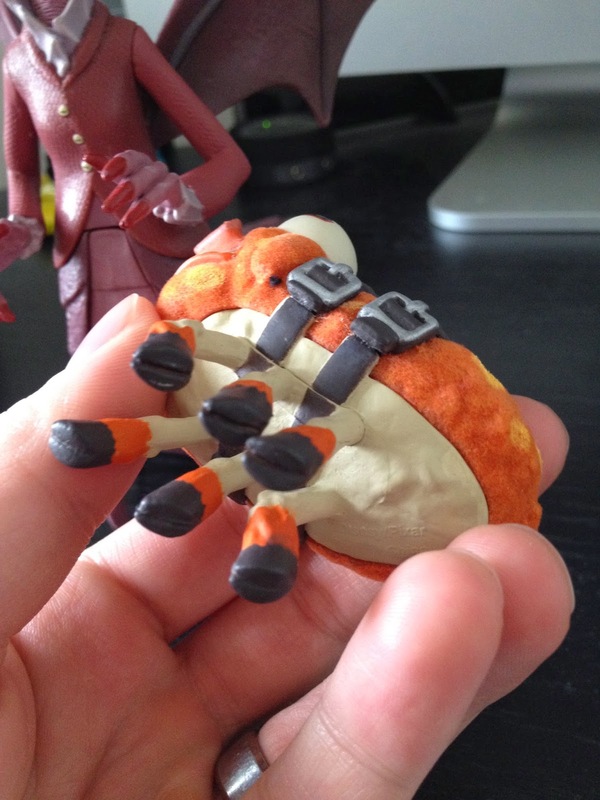 If you're on the fence about tracking down these figures, I hope this post convinced you. You won't regret it whether you collect the Disney Store OR the Spin Master figures. I have a feeling these two will be very hard to find in the pretty near future so get them while you have the chance. Contact me if you need help finding the eBay listing for these two! The seller does have more available. Last Spring, my wife Brita and I took a little road trip to CA for a few days to go Disney Land and California Adventure. It was such an amazing time with amazing memories! It was my first time visiting "Cars Land" and I couldn't have been more impressed with it. A big part of the fun of Cars Land was the gift shops. I was in Cars merchandise heaven! 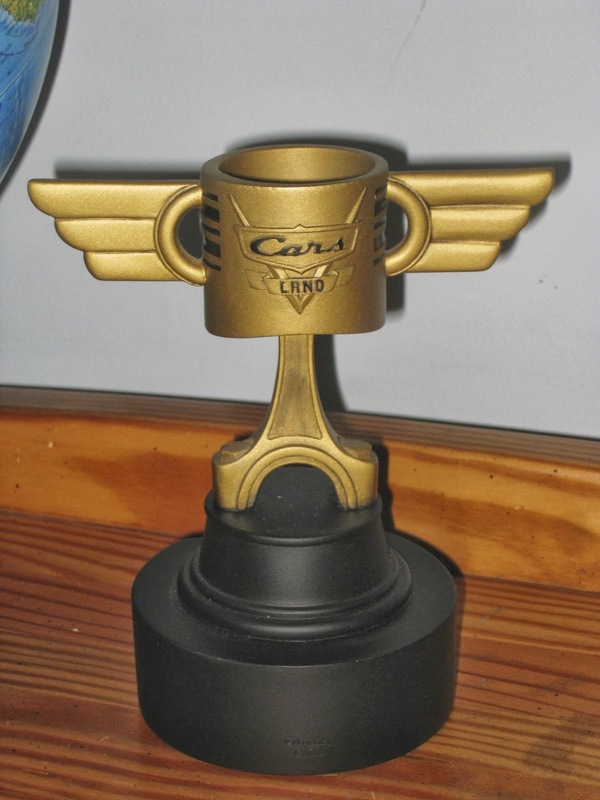 An item that stood out to be was the Cars Land exclusive commemorative Piston Cup trophy replica-since I love getting and displaying replica movie props. 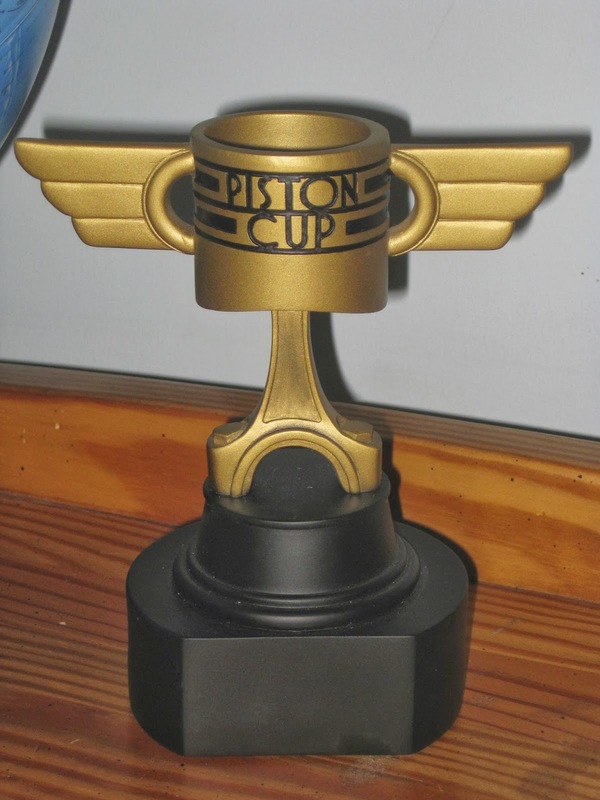 Below are a couple of pictures I took while I was there at Cars Land...you can see all the different variations they have on the Piston Cups such as "Best Wife", "Champion" "Best Son" and so on. While I was there, I didn't actually get one of these...but then I regretted it! Right before Christmas however, it came online on the Disney Store's website as a "Disney Parks Authentic" piece of merch! I was thrilled because not only was it available, but on sale too. So for Christmas, I got exactly the one I wanted (the basic one without any title/caption). It's going to look fantastic on a shelf someday with the rest of my Pixar collection. Thanks so much to my parents for hookin' me up! This thing is so awesome and really well made...its got some weight to it! I'm so happy I got it and it will be a great reminder of the fun we had there together at California Adventure. Unfortunately, it has since sold out on the DisneyStore.com. There are other ways to get it though so don't worry if you can't make it to Cars Land. You can find them on eBay periodically or you can call the Disney Parks merchandise hot line at 877-560-6477 (it may or may not work for ordering this but you can try). Thanks so much for visiting my blog today and if you like what you see, be sure to come back daily! 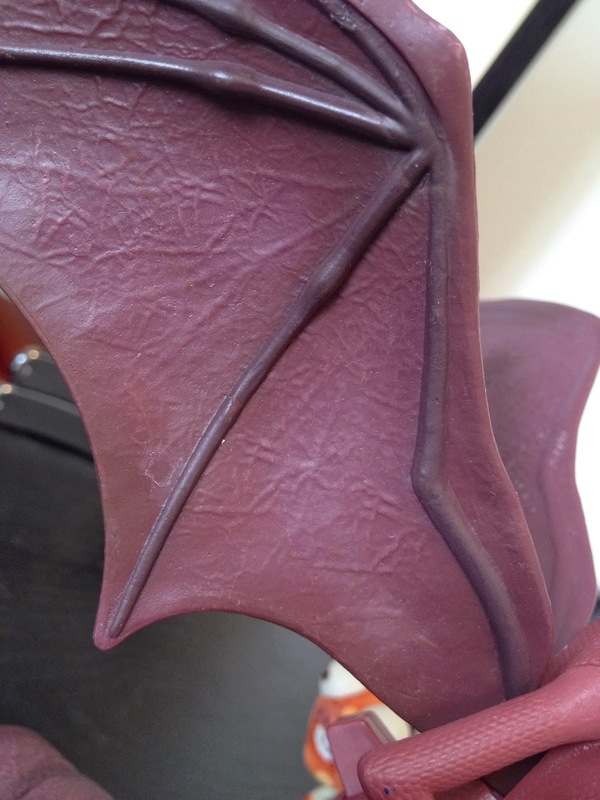 I update this page every day with an item from my Pixar collection. Stay tuned for more! 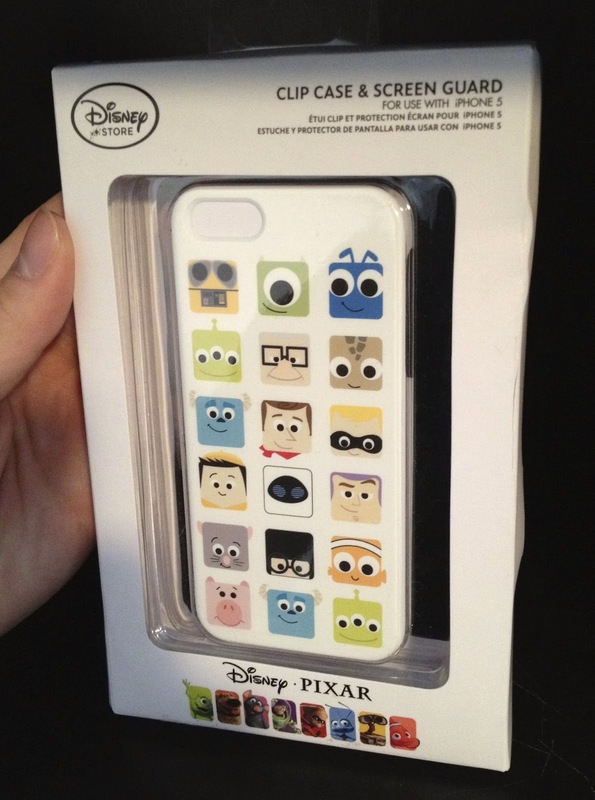 Following my post on the note card set from last week, here is the iphone 5 case from the same D23 convention/Disney Store exclusive Pixar collection! Like I've mentioned, when I saw this line of products, I was hooked on getting them. I just love the design and the minimalist style of the characters! In addition to this phone case there's a mug set, a second mug set, a note card set, a notebook, a Sticky Note Set, a pencil/eraser set and stickers. 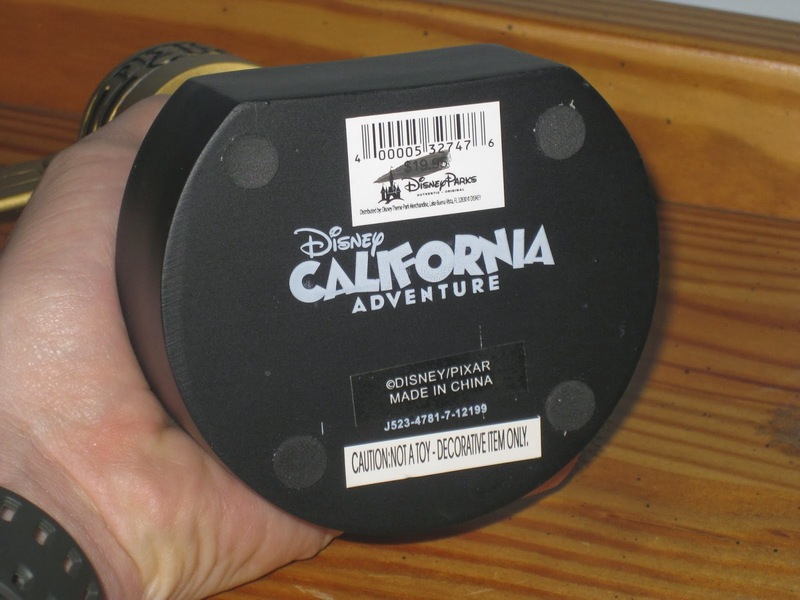 This case was first only available as a D23 exclusive last August (2013) and I was worried I would not be able to track it down. Luckily, however, this line became available to the public on the Disney Store's website soon after the event! I was thrilled. This case is fantastic...very well made and, like I said, a real stand out design. 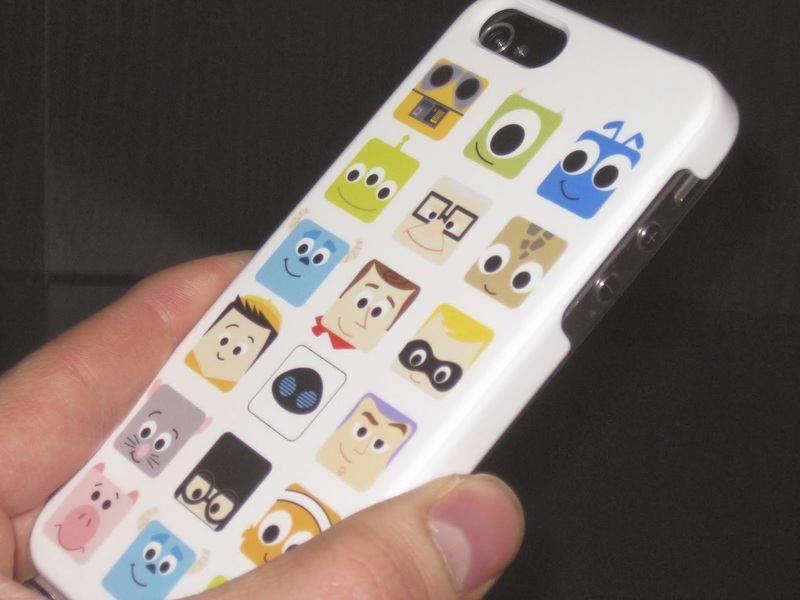 If this is your style, I definitely would recommend this case to any Pixar fan with an iphone! I haven't been able to find one of these cases on eBay lately (since they have, of course, been sold out on DisneyStore.com since last fall) but keep checking back there regularly! One just may show up one of these days. Let me know if I can help in any way and best of luck! Also, as usual these days, a big thanks to my in-laws for getting me this as a very thoughtful Christmas present! Love it.